An absolutely delish Saag Chicken recipe. Looks yumm and divine with the burnt garlic tadka on top. This saag chicken is very simple and easy to make. The creamy fine saag gravy takes this dish to an extraordinary level. This recipe tastes all the more delicious when the palak is in the season. The freshness of the spinach leaves makes this dish super duper yummy. This Saag Chicken is loved by one and all. Serve it with hot tandoori roti and sirka pyaz and see it disappear in minutes. It is the easiest way to make my son eat Palak. And the best part being it take cares of both protein and fibre in a single go. What more a mother can ask for. This Saag Chicken is a perfect Party main course recipe. Delicious and easy to make. 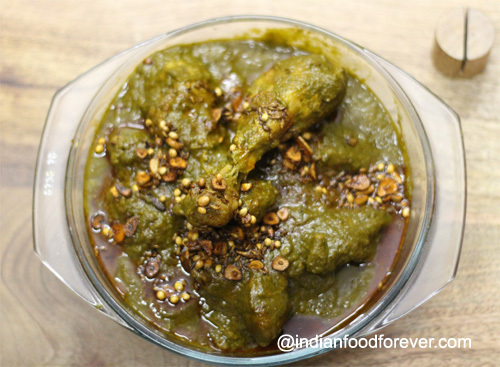 Here is the recipe for the finger licking good - Saag Chicken. Remove the stalk of the palak, wash the leaves and then boil it in an open pan with little water. Do not cover the pan or the palak will lose its color. Boil it for 5 minutes on high flame and then strain the water. If you really want to have a very dark deep green color just like in restaurants then immediately after taking it out from the hot water put the leaves in bowl of cold water.This will immediately stop the cooking and will preserve the green color of the palak. After few minutes strain the leaves and make a puree of it. Clean the chicken, wash it and keep it aside. In cooker heat the oil and then add 2 Brown Cardamom, stir it for few minutes and then add onions. Saute the onions till they become pinkish. Then add ginger-garlic paste. Cook it till the rawness of the garlic disappears. Now add the pices - Haldi, Red Chilli Powder, Coriander Powder and salt. Add a tablespoon of water to make sure the masala does not burn. Now add pureed tomatoes and let the masala cook till the oil starts separating. Add the chicken pieces and cook the chicken for 15mins in this masala. Add the palak puree and kasturi methi. Cover the lid and cook it for 10 more minutes and then add the green cardomom powder and garam masala. Mix well. Dish out the chicken in a bowl and start preparing for the tadka. Heat ghee in a tadka pan. Then add the jeera seeds. when they begin to sputter add the chopped garlic and sabut dhania. Keep stirring till the chopped garlic gets a dark brown color. Switch off the flame and add the kashmiri mirch powder for that extra red tang. Immediately pour it over the saag chicken. Serve it hot with tandoori roti or naan with sirka pyaz.